MADNESS IN THE MITTEN IS BACK! After missing 2014 due to weather and trail conditions, Michigan’s prime push race is back for a 6th year. 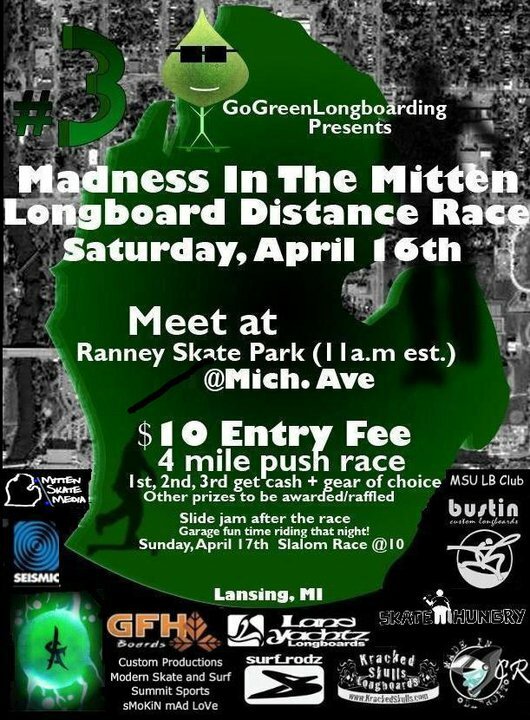 Founded by Go Green Longboarding and Bees Knees Skathletics, this is Michigans longest running event. A 4 mile push race (all are welcome!) followed by a slide jam. The event will take place in Lansing, Michigan, on April 25th 2015. Big news for Michigan Longboarders and downhill racers. Press release follows. Grand Rapids, Michigan is scheduled to host the State Games of Michigan Urban Downhill Skateboard Competition – June 21, 2014 presented by Kendall College of Art & Design, Bustin Boards Custom Longboards & Rey Trucks. Parent Sponsor Organization, Meijer State Games of Michigan inducted the Grand Rapids Urban Downhill Skateboard event as the 36th sport addition to the 2014 Summer State Games, an effort to diversify the Summer Games Sports line-up. The urban downhill is hosted on internationally recognized Go Skateboarding Day, reinforcing a greater motion to legalize Skateboarding for commuters in Downtown Grand Rapids, Michigan in 2014. The Grand Rapids Urban Downhill Skateboard event, socially-dubbed #GRDH, has attracted more than One-Hundred registered event participants to compete in the State of Michigan Summer Games Urban Downhill, plus an expected 2,500+ spectators. Downtown Grand Rapids issued downhill skateboard event organizers a permit to allow skateboarders to navigate one, half-mile of Grand Rapids urban terrain boasting 6% grade slope, right & left 90 degree off-camber turns and competitive bracket 4-person racing heats. The event is 4-8pm on June 21 during the Summer Solstice. The course starts on Lyon east of Lafayette, skathletes will turn left on Ransom & right on Fountain Street finishing before Division. Longboard-Skateboarding is recognized as fastest growing segment of the Action Sports Industry, worldwide since 2009. State Games of Michigan Urban Downhill Skateboard event organizer Mike Dallas is a Partner of New York City based Bustin Boards Longboard Company and is a local Graduate of Rockford High School & Aquinas College, also attended Calvin College. Throughout school, Mike enjoyed participating in action sports during all 4 seasons of the year. Now, Dallas is focused on product development, materials sourcing, and marketing with Bustin Boards Longboard Company. Since 2013, Dallas is back in Grand Rapids, focused on skateboard production, sales and event promotion in Midwest. Time for the first and best annual push race in MI! Grab your helmets and boards, rain or shine ladies and gents! More info on the FB event. Flyer and sponsors coming soon, there’s always a huge stash of prizes to go around. You don’t want to miss this! “What’s happening smoking mad lovers! Here’s some big news for you competitive pushers out there. There is going to be an IDSA marathon race taking place in Grand Rapids this summer. This is the same organization that puts on The Adrenalina Skateboard Marathon so you can see how there is awesome potential in getting this thing promoted and bringing attention to our local scene! This event has been in the planning stages for a couple months, but we have finally nailed down a time and place. MARK THIS ON YOUR CALENDAR! The marathon is going to take place on June 23 at Millennium park. The IDSA is working right now on adding this event to their official schedule for 2012. …” Read the rest of the article Here. Madness in the Mitten, Michigans premier push race, is scheduled for this weekend (Apr 16th and 17th). See the Forums or the Facebook event for more details. See you there!